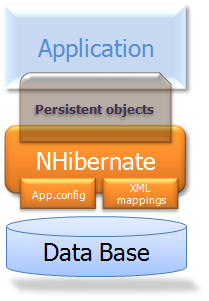 This diagram shows NHibernate using the database and configuration data to provide persistence services (and persistent objects) to the application. The "full cream" architecture abstracts the application away from the underlying ADO.NET APIs and lets NHibernate take care of the details. A threadsafe (immutable) cache of compiled mappings for a single database. A factory for ISession and a client of IConnectionProvider. Might hold an optional (second-level) cache of data that is reusable between transactions, at a process- or cluster-level. A single-threaded, short-lived object representing a conversation between the application and the persistent store. Wraps an ADO.NET connection. Factory for ITransaction. 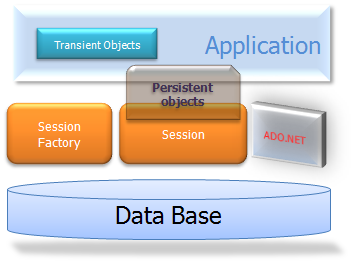 Holds a mandatory (first-level) cache of persistent objects, used when navigating the object graph or looking up objects by identifier. Short-lived, single threaded objects containing persistent state and business function. These might be ordinary POCOs, the only special thing about them is that they are currently associated with (exactly one) ISession. As soon as the Session is closed, they will be detached and free to use in any application layer (e.g. directly as data transfer objects to and from presentation). Instances of persistent classes that are not currently associated with a ISession. They may have been instantiated by the application and not (yet) persisted or they may have been instantiated by a closed ISession. (Optional) A single-threaded, short-lived object used by the application to specify atomic units of work. Abstracts application from underlying ADO.NET transaction. An ISession might span several ITransactions in some cases. Transaction scopes may be used instead. (Optional) A factory for ADO.NET connections and commands. Abstracts application from the concrete vendor-specific implementations of DbConnection and DbCommand. Not exposed to application, but can be extended/implemented by the developer. (Optional) An interface encapsulating differences between ADO.NET providers, such as parameter naming conventions and supported ADO.NET features. (Optional) A factory for ITransaction instances. Not exposed to the application, but can be extended/implemented by the developer. 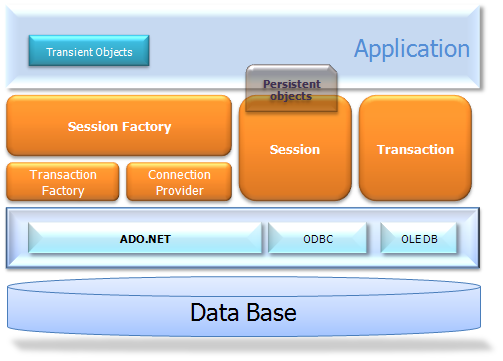 Given a "lite" architecture, the application bypasses the ITransaction/ITransactionFactory and/or IConnectionProvider APIs to talk to ADO.NET directly. The instance is not, and has never been associated with any persistence context. It has no persistent identity (primary key value). The instance is currently associated with a persistence context. It has a persistent identity (primary key value) and, perhaps, a corresponding row in the database. For a particular persistence context, NHibernate guarantees that persistent identity is equivalent to CLR identity (in-memory location of the object). The instance was once associated with a persistence context, but that context was closed, or the instance was serialized to another process. It has a persistent identity and, perhaps, a corresponding row in the database. For detached instances, NHibernate makes no guarantees about the relationship between persistent identity and CLR identity. Most applications using NHibernate need some form of "contextual" sessions, where a given session is in effect throughout the scope of a given context. However, across applications the definition of what constitutes a context is typically different; and different contexts define different scopes to the notion of current. Starting with version 1.2, NHibernate added the ISessionFactory.GetCurrentSession() method. The processing behind ISessionFactory.GetCurrentSession() is pluggable. An extension interface (NHibernate.Context.ICurrentSessionContext) and a new configuration parameter (current_session_context_class) have been added to allow pluggability of the scope and context of defining current sessions. NHibernate.Context.AsyncLocalSessionContext - current sessions are tracked by current asynchronous flow. You are responsible to bind and unbind an ISession instance with static methods of class CurrentSessionContext. Binding operations from inner flows will not be propagated to outer or siblings flows. Added in NHibernate 5.0. NHibernate.Context.CallSessionContext - current sessions are tracked by CallContext. You are responsible to bind and unbind an ISession instance with static methods of class CurrentSessionContext. NHibernate.Context.ThreadStaticSessionContext - current session is stored in a thread-static variable. This context supports multiple session factory only since NHibernate v5. You are responsible to bind and unbind an ISession instance with static methods of class CurrentSessionContext. NHibernate.Context.WebSessionContext - stores the current session in HttpContext. You are responsible to bind and unbind an ISession instance with static methods of class CurrentSessionContext. NHibernate.Context.WcfOperationSessionContext - current sessions are tracked by WCF OperationContext. You need to register the WcfStateExtension extension in WCF. You are responsible to bind and unbind an ISession instance with static methods of class CurrentSessionContext. NHibernate.Context.ManagedWebSessionContext - current sessions are tracked by HttpContext. Removed in NHibernate 4.0 - NHibernate.Context.WebSessionContext should be used instead. You are responsible to bind and unbind an ISession instance with static methods on this class, it never opens, flushes, or closes an ISession itself. The current_session_context_class configuration parameter defines which NHibernate.Context.ICurrentSessionContext implementation should be used. Typically, the value of this parameter would just name the implementation class to use (including the assembly name); for the out-of-the-box implementations, however, there are corresponding short names: async_local, call, thread_static, web and wcf_operation, respectively.